The notes below are about a meeting, in 2013, with Nick Clegg who was at that time Deputy Prime Minister. There is reference to an elephant in the room. Now three years later, we still have an elephant in the room. 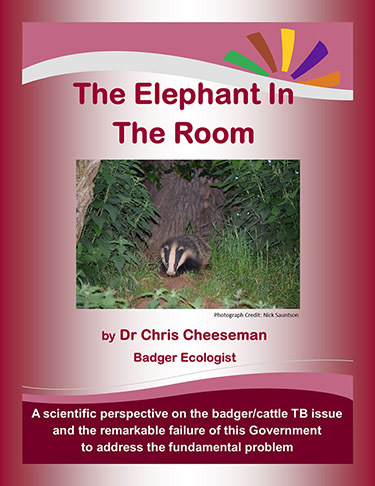 Published on 08 June 2016, this new scientific paper by Dr Chris Cheeseman talks about the remarkable failure of the Government to address the fundamental problem, namely the badger/cattle TB issue. Please click the image to take you to the page where you can read and/or download this crucial read. I don’t agree with Nick…………..
Like it or not, the ultimate fate of our badgers rests with our politicians. So when Norma and I had an invitation to meet with Nick Clegg on his recent visit to Cornwall we felt it churlish not to accept and went along determined to ask at least one question. The room was fairly full, though quite a few attendees were obviously planted members of the Liberal Democrats who had brought along their obviously planted (and house-trained) questions. I mention this obvious fact merely to stabilise my personal cynicism quotient! One or two non-planted questions did get through however; one of them was my question as to why, in the face of public, backbench MP and scientific opinion, the government was going ahead with a badger cull in 2013. I didn’t really get much of an answer; it was because the pilot culls had only been cancelled due to lack of deliverability (is there such a word? ), because the pilot culls were needed to establish a proper scientific base and (I kid you not) because we had to lessen the chance of people catching bovine TB (I’ve always known politicians think of voters as cattle!). Sadly however, Mr Clegg seemed totally unaware of the fact that badger vaccinations are already taking place in various parts of the UK. 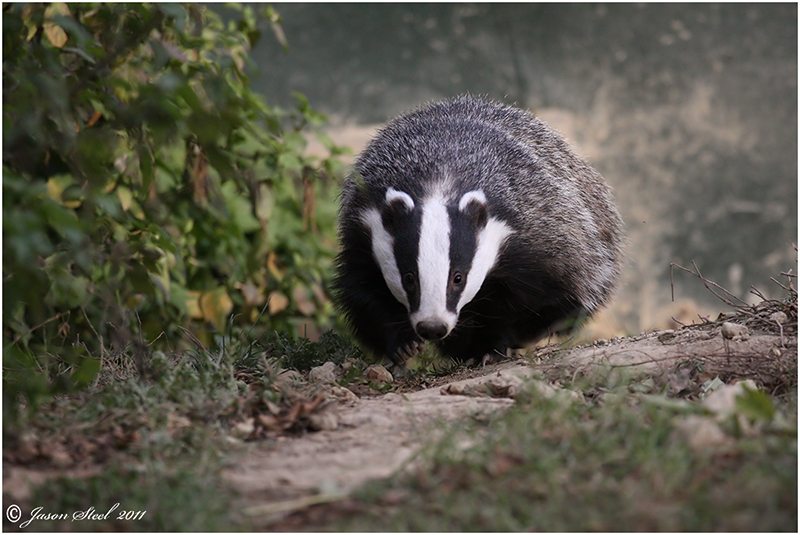 He maintained that vaccine was only at a laboratory stage – which conjures up a lovely picture of badgers being sent appointment cards for their vaccinations at the lab! So, all in all, not much of a result – but at least a few more people know of our concerns. And we had a lovely fish-and-chip supper on our way back home. 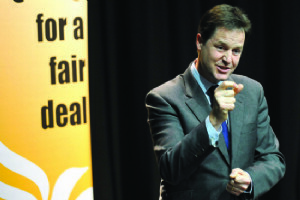 It was my second question to Mr Clegg; “Will Cornwall be one of the sites of a cull in 2013”. He didn’t answer that one at all – just ignored it! Many issues were explored, from the Government investing in geo-thermal energy, to the proposed badger culls in Cornwall (with Mr Clegg assuring the audience that he didn't have a "badger vendetta"), to issues over planning and house-building in the county. I have to admit, I was surprised. Apart from when he dodged questions by doing those things that all politicians love to do (talking about their achievements, saying how they are much better than the other parties and, in some cases, twisting words and turning the asker of the question into the bad guy), I was surprised how well he coped under the pressure of the spontaneous and huge range of questions (and, of course, the inevitable angry questions). He even hit on some highly topical issues, including the recently approved cut in the welfare budget, saying "choices have to be made" and "if you don't like it, fine, but come up with another plan". He said: "Tell me which schools you're going to cut, tell me which hospitals you're going to close, tell me which army divisions you're going to disband. You cannot carry on in politics somehow pretending there are easy, pain-free options. I'm afraid there aren't." The fact that there were so few people present meant that the majority could get a question to him if they wanted to. I asked about his thoughts on 16-year-olds being able to vote and whether he agreed that if we can work and be actively affected by the choices made by government, then we should have a say. He agreed and went on to say: "When I ask people why they don't think someone who is 16 and 17 should get the vote, they say 'oh they can't possibly know enough to make a judgement' but I'll tell you what, I know plenty of people above the age of 18 who you could probably make a reasonable claim for not making a well-rounded decision. It's not an age-contingent problem." I wouldn't exactly call myself a hardened Liberal Democrat voter, but I found myself almost mesmerised by how agreeable he was. Of course there were points where he twisted people's words and that was irritating, but in all honesty I expected more back-tracking and trying to please the crowd. But that's not what we got, he stuck to his word and his policies.